California Department of Water Resources has issued the final California Statewide Groundwater Elevation Monitoring (CASGEM) Groundwater Basin Prioritization list, a statewide ranking of the importance of California groundwater basins and subbasins. The list was required by legislation to help the department evaluate the need for additional monitoring under the CASGEM Program, which was designed to track seasonal and long-term trends in groundwater elevations. Of the 515 alluvial groundwater basins and subbasins in California, 127 (or nearly 25%) have been identified as high or medium priority. These basins represent 96% of annual groundwater pumping and supply 88% of the California population which resides over groundwater basins. The final ranking was determined based on eight criteria: overlying population; projected growth of overlying population; public supply wells; total wells; overlying irrigated acreage; reliance on groundwater as the primary source of water; impacts on the groundwater, including overdraft, subsidence, saline intrusion, and other water quality degradation; and other information DWR determined relevant. 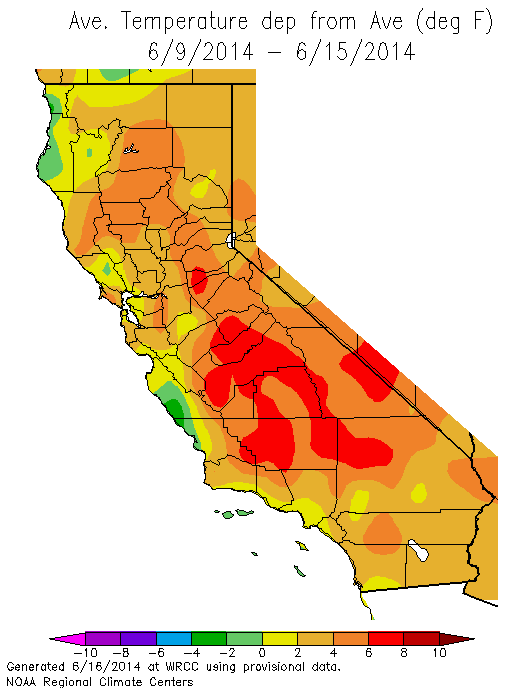 The Association of California Water Agencies has issued a report about the current impacts of the drought and areas of concern for the coming years. 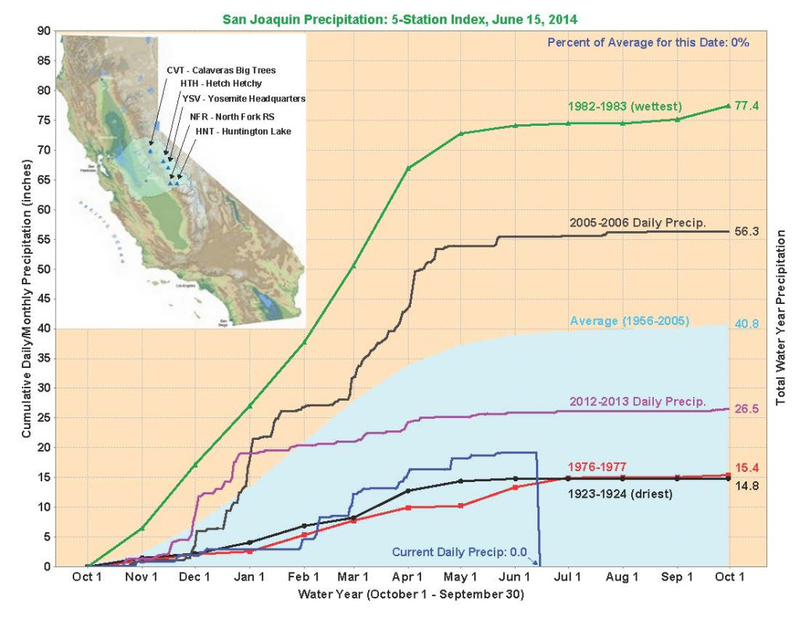 The report also outlines strategies and priority actions to address this and future droughts. The California Sportfishing Protection Alliance and AquAlliance have sued the U.S. Bureau of Reclamation to stop water transfers from the Sacramento Valley through the Delta to the San Joaquin Valley. Average temperatures in most of California have been much higher than average this past week, particularly in the central valley. A new report indicates this is the warmest year so far on record. 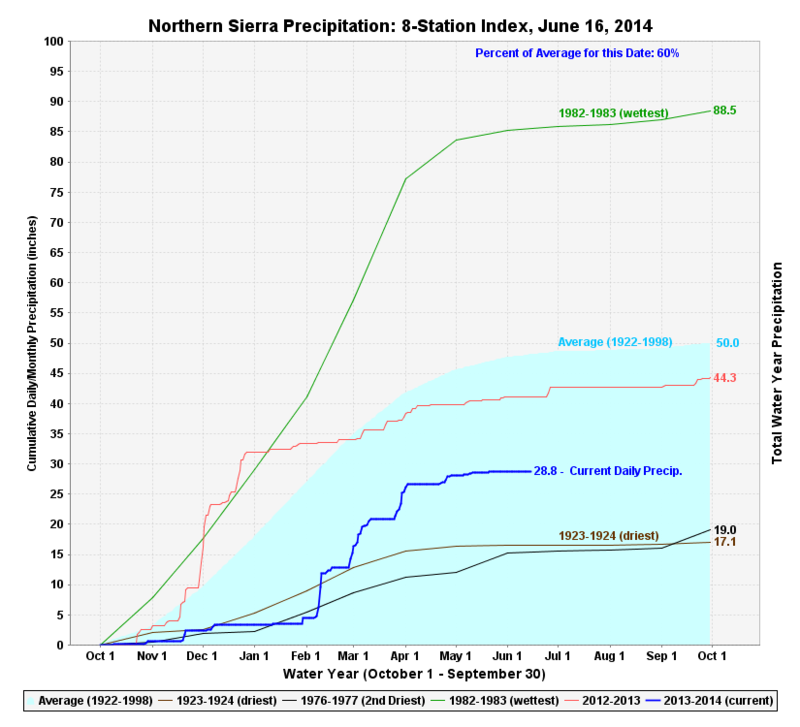 Cumulative precipitation for this water year to date has been 60% and 49% of normal in the northern Sierras and the San Joaquin, respectively. 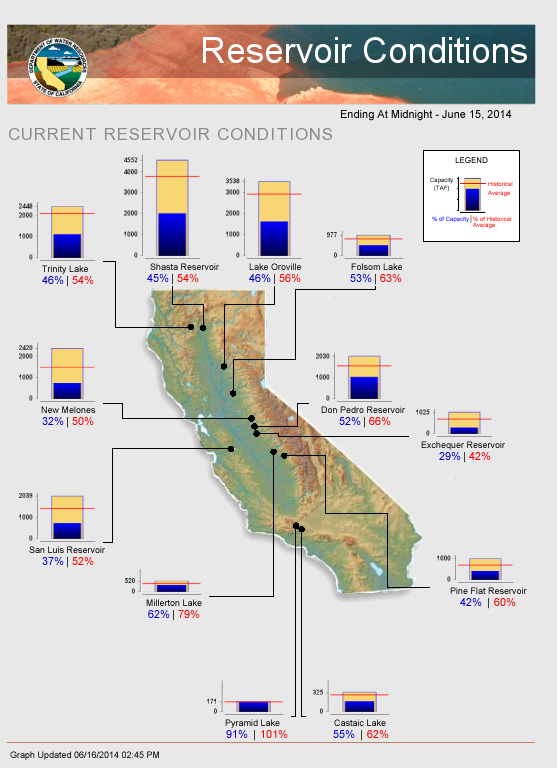 Statewide, California’s major reservoirs are at about 47% of total capacity and 59% of normal.